4109. Three Nymphs: A patch of hot springs bubbles from the ground here, coating the ground in translucent, poisonous salts and causing nearby vegetation to twist and wither. The hot springs are home to three nymphs, Yemun, Chuka and Manai, who have serpentine tongues and a taste for plum wine. 4147. Azer Lair: Through a stone arch in the side of a mountain one can enter the blazing hot lair of a band of seven azer, black-skinned and bulbous-nosed and occupied in the manufacture of weapons for Lei Gong, the Duke of Thunder. Beyond the arch one enters a cavern of glassy basalt, empty and dry, though there is a sheen of moisture at the back of the cavern where a natural slide grants access to lower caverns. The slide spirals down into the earth about 300 feet and presents a significant obstacle to climbing back up, as it is as smooth as glass. At the bottom of the slide there is a collection of caverns, all starting out as great bubbles of poisonous gas in a massive flow of lava, and now inhabited by the azer. The largest has a deep pit, maybe miles deep, in which bubbles magma that is used by the azer for their fire. Their anvils surround the magma pit. A few feet away there is a trough dug into the stone in which water flows from another cavern, a cavern of steam blocked by an iron gate traced with silver glyphs and sealed with a complex lock. Steam rises into this chamber from below and condenses to form the stream that feeds the azers’ trough. A mihstu inhabits this cavern, and it is the mihstu that the magic gate is designed to thwart. Other caverns contain the living quarters of the azer, decorated with basalt couches and bronze sculptures that are geometric and abstract, and storage chambers containing their tools, their iron, bronze and adamant ignots and armories with their armor and weapons. The living quarters of the seven brothers holds a gilded cage inhabited by a nightingale, a polymorphed sylph that displeased the Duke of Thunder and now wiles away in the acrid, choking air of the azers’ lair until Lei Gong has decided she has suffered enough. 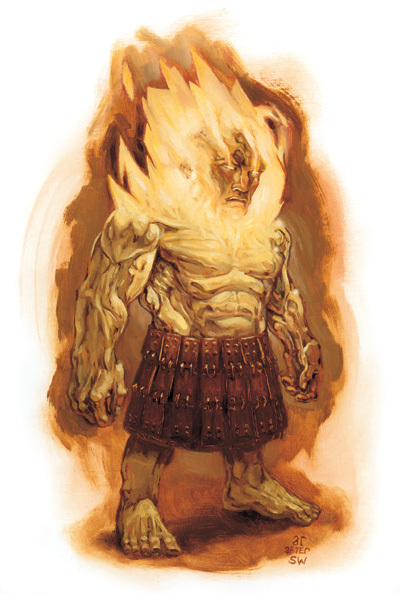 Image of azer by Sam Wood and owned by Wizards of the Coast.